As I've written in the past, writing this blog is easy. (In part, because I - obviously - don't proofread it.) Sometimes finding interesting cars is tough, though. My friend, Jon, sent me an e-mail last week with the links to these 3 cars. All were interesting enough to write about. Thanks, Jon! 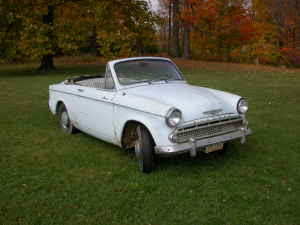 1959 Hillman Minx Convertible - My grandmother worked for Rootes Motors in Manhattan. I remember seeing brochures around her house for Rootes cars. One of the biggest reasons my first British roadster was a Sunbeam was because of having seen all those brochures as a kid. I've always had an interest in Hillmans for the same reason. Hillman was another Rootes brand. Designed with help from Raymond Loewy, the Minx had a distinct US flavor to its design. It was a car that never found its proper niche in the US, however. The Minx was bigger and better equipped than an economy import, but not as big or as well equipped as a luxury import. In the US, in the 1950s and 1960s, we only bought cheap imports (i.e. Volkswagen Beetle), luxury imports (i.e. Jaguar) or sporty imports (i.e. MG, Triumph, Alfa Romeo). The Minx didn't fit into any of those categories and was not a huge seller. This is a fairly rare 1959 Minx convertible. It needs some work. The seller says it needs "minor brake and engine repair and cosmetic restoration". That's pretty vague. However, if the engine (most likely a Rootes 1500cc engine) isn't seized solid and the "cosmetic restoration" doesn't include tons of rust repair (common on the Minx), this might be a nice restoration project and a cool show car for next year. Located in Cleveland, OH, click here to see the Craigslist ad. (The ad has very little text and just 2 pictures). "What's a Hillman? The Hillman Minx Pages" is a fun, informative, US website dedicated to these cars. It's worth checking out. 1964 Studebaker Wagonaire - Today, when car companies run into financial trouble, they turn to the federal government for help. Back in the day, they created innovative and interesting cars in an attempt to bring people into their showrooms. Without a lot of development money available, these cars usually had interesting bodywork wrapped around ancient mechanicals. This just such a car. The Wagonaire was produced for just a few years, 1963 through 1966. What made it unique was the sliding rear roof. Need the cargo carrying ability of a pick up truck? Simply slide the roof back and you have it. This 1964 Wagonaire appears to be in rough, but restorable condition. 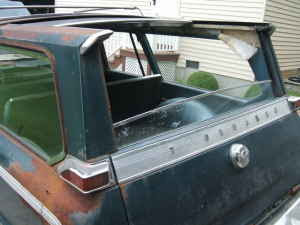 The seller is including a 1964 Studebaker Commander in the deal. 1964 was the last year this car used a Studebaker engine. In 1965 Studebaker started buying engines from GM. I guess you could call this car one of the last pure Studebakers. 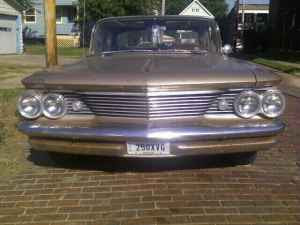 Located in Painesville, OH, click here to see the Craigslist ad. 1960 Pontiac Catalina - Wow. This is the second big old Pontiac I've written about in one week. That's definitely a record. Jon pretty much summed up the appeal of this car in one sentence in his e-mail; "Less than 50K - and cheap." This 41,000 mile Catalina is being offered at $2500.00 (The seller says the price is firm). According to the seller it runs and drives and just needs paint. It's tough to tell from the pictures, but it looks like it might also need some rust repair along the rockers and door bottoms. If you're into big, old American cars, this could be a great car to restore back to it's original condition. Bring it to your local Cruise Night and watch all the attention it gets. Thanks again to Jon for sending me the links to these cars. My Dad had a 59 Minx convertible back in the day. His brother, my Uncle, had a 60 Pontiac ragtop.